One of the bonuses you receive when designing a custom kitchen is the opportunity to maximize storage and organize everything exactly according to your needs. Specialized storage that is well designed helps eliminate wasted space in the kitchen. The storage details you select should reflect the needs of you and your family. Even if you’re not planning to remodel your entire kitchen, we have several tips and creative solutions that will make your cabinets more efficient. We had an interesting exchange on Kitchen Designs’ Facebook Page about this topic where someone commented that the drawer inserts were way too organized. She didn’t find it liberating to have to be so neat… quite the contrast to a recent client of ours who requested her forks and silverware be raised individually via remote button so that only one can be seen at a time (I kid you not). Therefore, the way you configure the “inside the cabinet” storage is as uniquely individual as the overall kitchen design. The key is having a great designer that listens and understands your needs. Your space will work best when it is functional, so pay careful attention to the detailing of the interiors of your cabinetry. Roll Outs: Deep cabinets with open shelves just don’t work unless you love being on your knees and having to take everything out to reach what is in the back. Roll out sliding drawers are a much better solution; they allow you view what’s in the back of the cabinet with the touch of a finger. Magic Corner Solution/Full Lazy Susan – You can also opt for half lazy susans that can be hinged right or left. If you’re looking to add these to your existing kitchen, Hafele makes some fantastic pull outs. 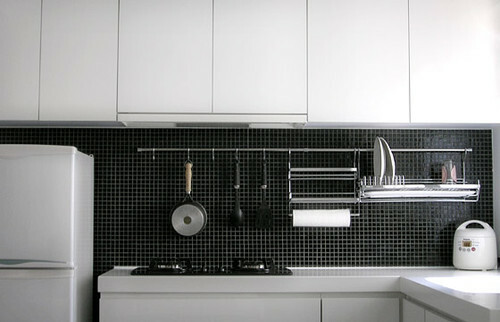 Pot Racks – Short on space? A pot rack may be the perfect solution. You can purchase these Enclume pot racks at Amazon. See video about these racks here on this post. Rail Systems are a great way to add extra storage and save drawer space (great for apartments & smaller kitchens -Photo courtesy of Houzz). I recently saw some nice Rosle Stainless Rail systemsin stainless rail systems you can buy fairly reasonably at Amazon (affiliate).